“He Kēkelē Hawaiʻi Mai Nā Kūpuna Mai:” Introducing Dr. Larry Kimura!!! ʻŌiwi TV > ʻŌiwi TV > “He Kēkelē Hawaiʻi Mai Nā Kūpuna Mai:” Introducing Dr. Larry Kimura!!! Ua kamaʻāina loa kēia maka i waena o ko ke kaiāulu Hawaiʻi, he kupa o ia ʻohana kaulana no Waimea, ʻo nā Lindsey nō hoʻi. He pou paʻa o ke aukahi hoʻōla ʻōlelo Hawaiʻi no kēia mau makahiki 30 a ʻoi, he haku mele laha a kaulana…. A i kēia manawa, he kauka nō hoʻi ʻo Larry Kimura! A ʻoiai he haumana ʻo Larry, ʻakahi a puka ma ke koleke ʻōlelo Hawaiʻi, ʻaʻole loa ʻo ia he mea ʻakahi a komo i ke aukahi hoʻōla ʻōlelo Hawaiʻi. ma kēia wā o kona ola, ʻaʻole pono. Akā, he mea nui kēia no ka mea, ma waena o kākou he mea nui kēia ʻano noʻonoʻo, hoʻokō ʻana i ka ʻimi naʻauao. A ʻo Larry kekahi i loko o kēlā,” i ʻōlelo ai ʻo Hiapo Perreira, he polopeka no Ka Haka ʻUla O Keʻelikōlani ma ke Kulanui o Hawaiʻi ma Hilo. Ua kālailai ʻo Larry i ka ʻōlelo o nā mānaleo Hawaiʻi, me nā loina i hoʻomau, a hoʻomau ʻole ʻia paha ma o nā hānauna. Nāna pū nō i haku a kūkulu i wahi ʻolokeʻa a kālaikuhi no ke kālailai ʻana i kēia mau hopena. Eia naʻe, i loko nō o ka helu ʻia ʻana o kēia hana, he pae hou o ka ʻimi naʻauao, ʻaʻole i pili ka nui o kā Larry mau hana lokomaikaʻi i ka ʻimi kekele ʻana. Ma nā kanahiku a kanawalu nō hoʻi, ua alakaʻi a mālama ʻo Larry i nā pukana he 400 a ʻoi o Ka Leo Hawaiʻi, he polokalamu lekiō ʻōlelo Hawaiʻi e hoʻokipa a ʻoki leo ʻana i nā manaleo nui o ia wā. “A laila, kiʻi ʻo ia i kēlā ʻike a hoʻoili ma luna o nā haumāna āna, e like me aʻu, ʻo au kekahi o kāna mau haumāna mua loa; a nui ka pōmaikaʻi o mākou,” i ʻōlelo ai ʻo Pila. Ma muli o ka lōʻihi loa o kona ʻimi ʻana i ka ʻike mai ka poʻe mānaleo mai nō, a me ka nui o kāna i aʻo ai maiā lākou mai ma ka launa wale aku ma ka hale a pēlā, ua ʻano ʻokoʻa hoʻi kona manaʻo no ka ʻimi i kēia ʻano ʻike pili i ka ʻōlelo ma ka ʻaoʻao kālaʻike ma ke kula, ma kēia ʻano ʻimi kekelē laeoʻo a laeʻula nō hoʻi. A eia hoʻi, i loko o ka paʻa aku nei o kēia kēkelā iā ia, ua like loa nō paha kona manaʻo a me ke kuanaʻike no kēia. ʻO kēia hoʻoikaika a ʻimi kēkelē ʻana ona, ua kumu i kona makemake e hōʻoia a hōʻike leʻa aku i ka waiwai maoli nō o ka ʻike o kēia poʻe kupuna, kēia poʻe mānaleo nō hoʻi. “ʻO ke komo ʻana o kākou i loko o ka hana hoʻōla ʻōlelo Hawaiʻi, he mea kōkua i ka hoʻomakakau i ka noʻonoʻo ma kēia nānā hou ʻana i ke kumu, ʻo ia hoʻi ka ʻōlelo mānaleo paʻamau me ka hoʻomanaʻo ʻana iā kākou e pili ana i ka hana a kākou. ʻAʻole hiki ke loaʻa wale kēlā ʻano, e hoʻokaʻawale i manawa kūpono e nanā ai. No laila, ua ʻike au i kēlā a mahalo nō hoʻi kēlā wā,” i ʻōlelo ai ʻo Larry Kimura. His is a familiar face in the Hawaiian community, a member of the well-known Lindsey family of Waimea. A pioneer of the Hawaiian language movement over the past 30+ years, a celebrated composer; and now, Larry Kimura adds “PhD” to his accolades. He may be a recent graduate from the Hawaiian Language College, but he’s no newcomer to the language scene. “When you consider all Larry has done over all these years, at this point in his life, he really didn’t have to do this. 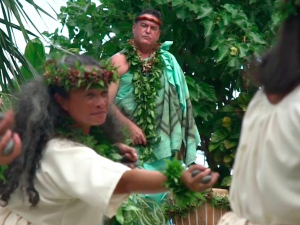 But, we are all committed to life-long learning and education; Larry included.” Hiapo Perreira, an Associate Professor of Ka Haka ʻUla O Keʻelikōlani at UH Hilo. Larry analyzed the language of native speakers and aspects that have and have not endured over generations. He also developed a framework for this analysis. And while this is a mark of academic success, Larry’s greatest contribution has nothing to do with an academic degree. 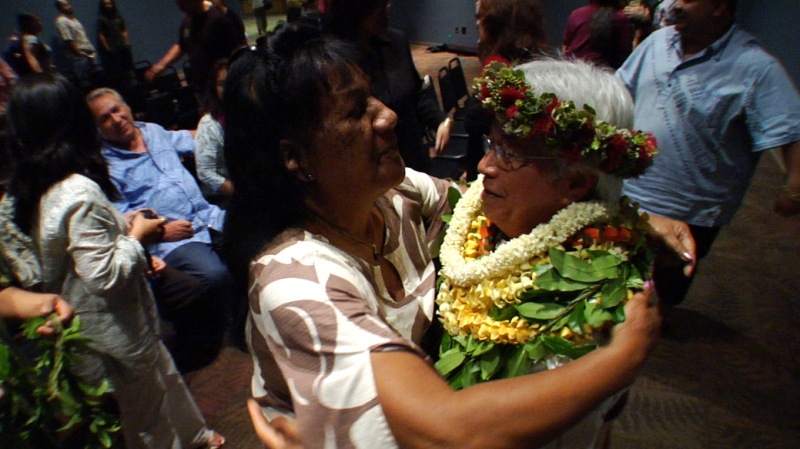 “His priority was traditional knowledge; a degree straight from the kupuna.” says Pila. Back in the 70s and 80s, Larry hosted over 400 episodes of Ka Leo ʻŌiwi, a radio program that hosted native speakers. Given Larry’s years of study and learning directly from native language speakers, for a long time, he had somewhat of a love-hate relationship for pursuing this knowledge in an academic setting. And in hindsight, his perspective is the same. This academic research of his was motivated by a desire to bolster the validity and applicability of the knowledge of these kupuna, namely native speakers. “As the language revitalization movement progresses, we must constantly look back to our native speakers as a reminder of why we are doing this. Time spent with them shouldn’t be taken for granted and I appreciate all the years I had with them.” says Dr. Larry Kimua.